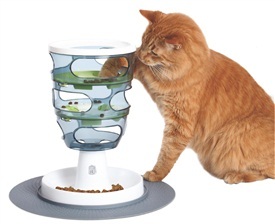 Hagen CAT it Cat Senses Food Maze  - HKD168 : PetPetMaMa , The Best Products for our pets! CAT it Cat senses are unique; they see and hear sights and sounds that are beyond our understanding, and with their sense of taste, touch and smell they experience the world in ways we can only imagine. Our line of Catit Design Senses products was developed with your cat in mind, designed to appeal to all of your cat's senses. Each Catit Design Senses product can be purchased individually, or be purchased together to create a complete Sensory Activity Center for your pet. This product was added to our catalog on Saturday 08 June, 2013.